A Sign in Space is a ‘sound-opera’ inspired by Italo Calvino’s short story of the same name. The famous Italian writer’s tale begins with a scientific fact about the universe, which then develops into a parable about creativity and the search for meaning. The story’s narrator—the unpronounceable Qwfwq—creates ‘a sign in space’ for the pleasure of seeing it reappear two hundred million years later as he orbits about the galaxy. In doing so, Qwfwq unwittingly generates a Babel of other signs and signs-about-signs whose meanings ultimately confuse and confound him. Commissioned by The Forge and Durham Cathedral, the opera is as much invested in playfulness and novelty as it is in the solemnity that characterises the setting for which it was conceived. 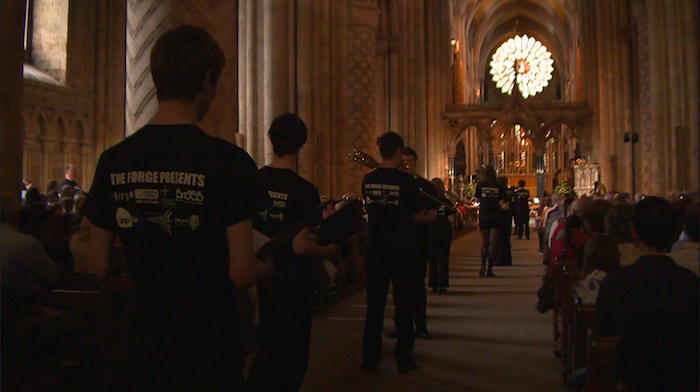 Designed to be performed by young people (a way of depicting Calvino’s youthful universe), and coincident with the much-publicised search for, and debate surrounding, the Higgs Boson (or so-called ‘God particle’) at CERN, the work engages with the concept of ‘space’, and, more specifically, the sacred space of the Cathedral.